Large firms have significant capitals and large scale marketing teams to boost the growth of their firm in the right direction. For small firms however the picture is completely different as one other major factor called Survival is added to the mix. As competition keeps increasing, the smaller CPAs need to draw out smarter strategies in order to get more clients in a cost effective way. In this article I am going to go in detail and show you different ways to market for your small accounting or CPA firm in a cost effective way. Before we do that its important to understand the importance of CPA firms and the competition in your industry. Accounting firms play a big role in the financial functioning and growth of any small business. Your firms generally handle responsibilities such as collecting financial data, accounting, profit & loss statements, review taxation and create reports based on cash flow. If you have the resources then you may even be providing professional financial audits. A reliable CPA firm is required for every small, medium or large business as it takes care of one of the most important aspects i.e. the money, creating time and space for you to think on other business goals. So there is a definite “need” for your business. However, the Accounting Industry grows more competitive every year. 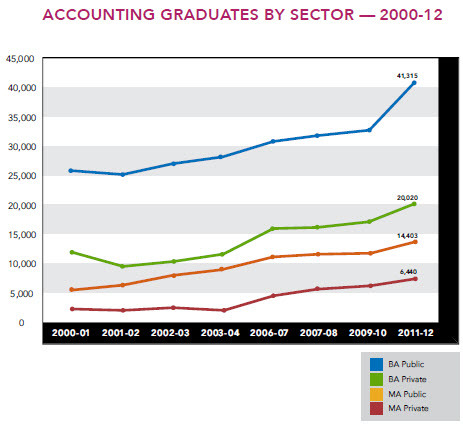 The number of accounting graduates increase every year. It has also become a ground for fierce competition among the thousands of CPA firms in the country (REF) in order to grab the best candidates. Look at the list of all CPA firms distributed over all city/ states in USA and you would get the real picture. The competition is huge and so you need to market your business effectively. Your business need to stand out. 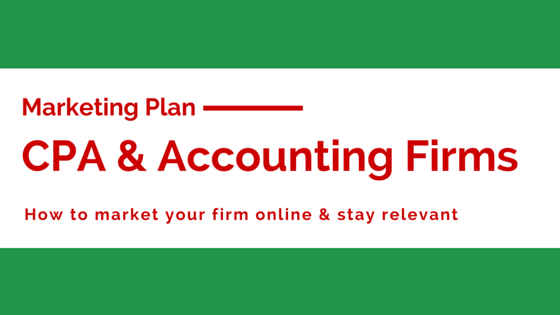 Marketing for Accountants – How should you market your firm? Marketing using the “Right” website. Local SEO – How to do local SEO for CPA and Accounting firms. How to get more online reviews for your accounting firm. Content Marketing – How to do content marketing for CPA and Accounting firms. Email Marketing – Your guide to starting out with email marketing. Other ways to market your CPA firm. Since consumer behavior has changed and most people look for solutions online, marketing for accountants starts with the right website. Potential clients are going to search online if they are looking to hire an accountant or a CPA firm. Below is the screenshot of how the number of searches have increased every year on Google which gives you an idea that if you are online then your business in invisible. In the United States millions of search queries are made every month related to CPA firm. Take a look at the following chart. To this day, good accountant cpa website design is an irreplaceable tool to market your business and successfully drive customers towards your firm. Since, every CPA firm is going to have a website you need to make sure that yours stands out from the rest. Let us take a look at few of the below features that your website must have. Also check out our list of 50 features every small business website must have. Responsive website: Smartphones are used by everybody and number of searches on mobile devices have increased every year. 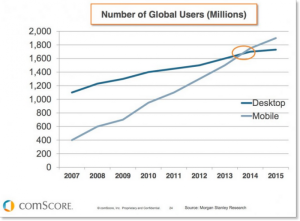 Below is a great chart by comscore on how the use of mobile device has increased each year. Chances are high that people will try to access your website from smartphones and tablets. If your website is not mobile responsive it wont load properly on such devices leading to loss of potential customers. A responsive website loads properly across all screens. If you are not sure if your website is responsive or not then you can use this tool to check. If the test result is negative, then you need a mobile responsive website. So a responsive site is the first thing you need to have in the strategy for marketing for accountants. Call to action: Your potential customers are visiting your website and reading the content you have put up there. Once you have traffic coming on the website the next step is to convert that traffic to a potential customer. The chances of such a conversion are higher if you have propr call to action buttons on your site. With proper call to action items you can capture their details and follow up with them later. The simplest way is to have your phone number in big bold letters in the header of the site or provide a button to fill a simple form. You can also drive the traffic to a ‘Free Consultation’ or ‘Get Quote’ page of your website which are variations of the form as mentioned above and hence as a Northern Virginia website design company we make sure to integrate call to action buttons on the header of every website that we design. Placing the call to action form or button at the right position can have a huge impact. You might observe significant ups and downs in conversion rate (people visiting your website Vs people filling up the form) based on where you place the call to action form or button. Once you have the website and the traffic It is something you need to test at your end; ideally you should keep it at top right corner, as shown in the diagram below, so that your visitors can find the form as they land on the website. Blog: Blog posts play a big role in the marketing for accountants. Infact blog is a must for any business that intends to establish a strong online presence and this is especially true for B2B businesses like CPA and accounting businesses. It helps you to start the conversation with your present or future clients, it lets you share insights with your customers which eventually establishes you as a thought leader in your industry and finally it allows you to create fresh and relevant content which has a tremendous impact on SEO. So, make sure you have a blog and feature top blog posts on the home page of your website. If you have a blog then its very important to make sure that you keep it updated. The last thing a potential client wants to see on your site is a blog post that was last posted in 2013 which they might then start thinking that you are not in business. So keep it fresh and updated. Newsletter sign up feature: Your website must have a feature where potential users can sign up to receive newsletters from you. using an inexpensive tool like Aweber. Assume you are generating quite a few leads every day. Some of them get converted immediately; on the other hand, some are not mature leads and may get closed within the next 6 months or a year. Newsletters can be of great help when it comes to doing business with the second type of leads. By nurturing the leads and sending an informative newsletter at regular intervals, you will stay in their memory and you will have many more chances to bring them back to your website. 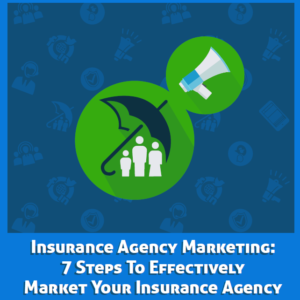 This process can also help you increase your client retention rate. Apart from usual lead capturing forms, keep a separate option on your website so that readers can subscribe to the newsletter. You can use services like Aweber to manage this entire newsletter marketing process and make it an integrated strategy for marketing for accountants. Social media integration: Link to your profiles on social media platforms such as Facebook, Twitter, Google+, Yelp and LinkedIn from your website letting your readers follow or like your CPA firm there and you get a wider audience to interact with. Also, use social sharing plug-in to let the readers share your blog content quickly. This will help to get social signals that Google is looking for when it comes to SEO and hence it should part of your strategy for marketing for accountants. NAP: Name, Address and Phone Number, abbreviated as NAP, of your website should be present on all the pages of your website, either in the page header or footer. You can also put the phone number or Contact Email along with as well. Apart from conversion, having NAP mentioned on all pages of your website helps you in local SEO; will talk more on this later in the article. As a website design company we provide CPA & Accountant website design service which includes all the features mentioned above. Click here to have us design a perfect website for you! Search engine is the primary go to place for your potential customers when it comes to finding information about anything be it an invoicing software, information about taxation and compliance, corporate attorneys or a CPA firm. 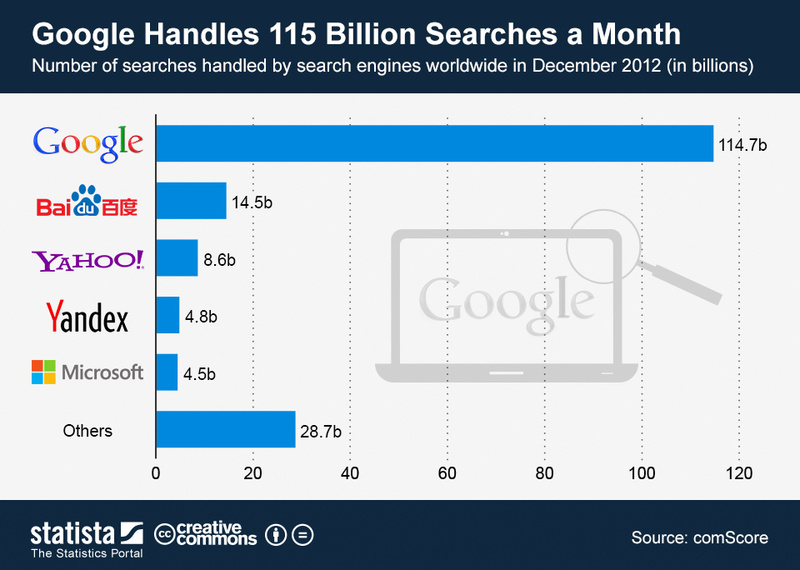 The following chart shows number of search queries all the major search engines handled all over the world in December 2012. It is easy to speculate that the figures have shot high in last 3 years. Pretty clear from the above chart that if your website ranks higher on Google, you will get more business from search engines. How to put your website on top of the search results page for relevant keywords? Local SEO service is the answer. By following certain guidelines recommended by Google, you can put the website of your CPA firm on top of the search results. However, it’s not a quickie. Once upon a time, getting higher rank was easy, but with Google’s ever-changing algorithm, things have evolved a lot. Here are some factors that help you achieve high rank on Google. 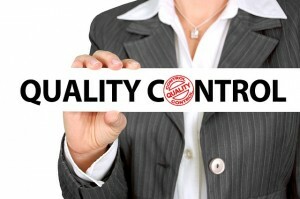 Quality content – unique, useful information around the interest area of your target audience. Are the titles and descriptions of different pages well optimized for SEO. Quality backlinks – links to your website from other relevant and authority websites. User experience – how comfortably users can browse your website including how much mobile friendly your CPA firm’s website is. How quickly does it load. Speed is becoming an important factor. Social signal – how many times people Like, Share and Comment on your content on social media. Local SEO can play an important role for CPA firm marketing. When you target people of a specific area, Google gives priority to local businesses. 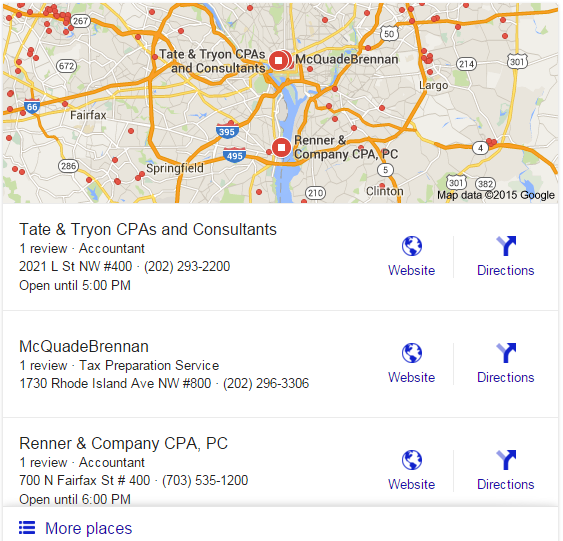 For example, when you search for “CPA firm Washington DC” Google Places and other local listings appear on top. Therefore, local SEO is an important action item for your CPA firm. 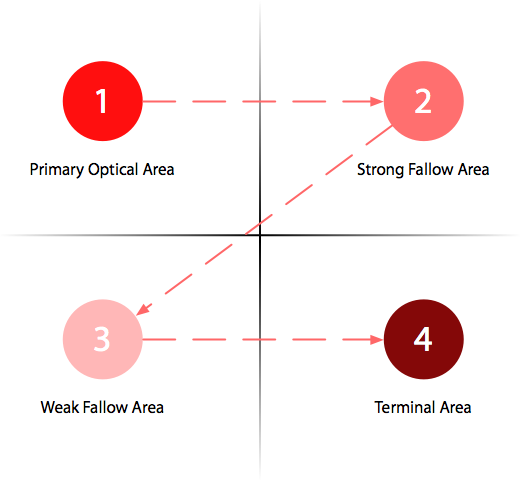 Here are the major factors that influence local search ranking. Use of category keywords in the title and description of your business listings. Signals and citations from local directories like yellow pages, yelp etc. NAP consistency across local and social listings. Review signals from local directories. Click here to have us implement a local SEO for you! 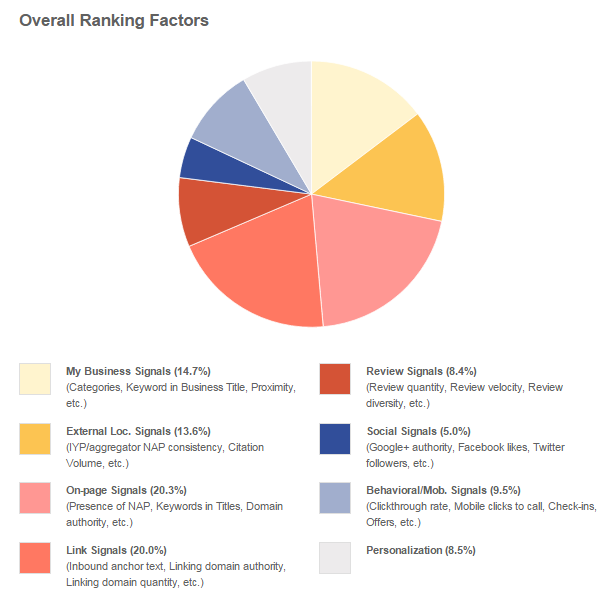 The following chart sums up all the local search ranking factors quite well. Exclusive bonus: Download the latest and most comprehensive list of local directory sites where your CPA or Accounting firm can be submitted to. Create profile for your CPA firm on Google Places (Google Business). Create profile on Yelp and other local business directories. Encourage your current clients, and prior clients to write a review for your CPA/Accounting firm on different local directories. Create LinkedIn and Facebook page and keep sharing content. Have the target city name in your website’s page Title. Acquire citations through PR, local influencer marketing and guest blogging. How to get more reviews for your CPA/Accounting firm? Like, Tweet or +1 us to unlock this email script to increase online reviews for your business. Content is King! By providing useful information to your target audience, you can grab their attention and increase the visibility of your CPA firm online. Importance of having a blog has been mentioned earlier in this article. Your content marketing activity can start from your company blog by writing relevant and insightful articles. Please do not write general articles that is just a rewritten version of what is already out there. Write something unique and different. While writing these blog posts, you can take help of Google’s Keyword Planner tool to get some idea on which keywords are highly searched. Use those words in your articles in a meaningful way. Remember, Google’s algorithm is pretty powerful – so do not stuff your articles with keywords – use target keywords in a natural way. Then you can cross-post these articles on other publishing platforms such as LinkedIn with a link back to the original story. Platforms like LinkedIn, Facebook have relevant groups. You can start discussion in those groups and promote your content. Apart from text based content, you can come up with attractive illustrations, infographics, eBooks, White Papers, slides, videos for your audience. Promote them as well. There are specific platforms for promoting infographics, images, slides, videos, PDFs etc. Email marketing is an excellent way to market your CPA firm. Here are the steps you need to follow to run successful email marketing campaigns. Before you do the following make sure that you sign up with your choice of email marketing service provider like Aweber. Add your existing clients to your email database. Do webinars and collect the email addresses of the participants. Create separate email lists. By making separate email lists based on different criteria such as, “potential clients who did not convert”, “100% target customer”, “somewhat interested” and so on, you can send them customized emails with catchy subject line, relevant copy and then evaluate your email campaigns. The objective is to increase email open rate and drive the readers to your website. Send relevant emails. Provide relevant information about tax, compliance and so on so that your readers click on the given links and visit your website. Keep experimenting with subject line, graphics and email content. By setting up a proper lead nurturing mechanism, you can send educational emails to your prospects as they enter your email list and gradually take them through the sales funnel which results inclosure. Email marketing is not an isolated process – you need to integrate email list building process with other activities, even offline activities your CPA firm is involved in. An integrated email campaign can help achieve your targets quickly. While following the strategies mentioned above, you can practice some other activities to reach out to your target audience. Feature your CPA firm as an expert with various accounting software providers. There are many accounting software providers with a loyal clientele. Solutions such as Waveapp or Intuit allow you feature your firm as an expert. This can be an easy route to get in touch with a wider audience. Partner with mainstream accounting firms and accountants, you can come up with an attractive referral business model to encourage your partners forward more leads to your way. Partner with other B2B businesses in your area like sign companies, graphic design companies, and commercial real estate companies who serve the same clients that you do, i.e: small businesses. Consider social media marketing especially on Facebook and LinkedIn. You can promote your CPA firm’s page, publish articles, share slides, run ads as well. You can also go for search ads and display ads. This can be a costly affair if not done the right way. The most important tip for paid ads is to not get users to land on your home page. Develop a separate landing page for each service that you promote through the ads.